Our creams preserve the delicate flavor of fresh produce. 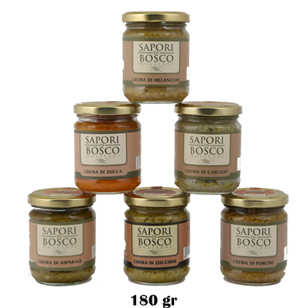 They are delicious products made from a simple and natural processing of fresh vegetables and extra virgin olive oil. The creams of vegetables are good to eat; immediately as an appetizer, on toasted bread or bruschetta or to use to enrich your first and second courses. Also ideal for seals. The vegetable creams are composed of fresh vegetables and extra virgin olive oil. The creams can be consumed either at room temperature after having been heated; to better use only add extra virgin olive oil and heat for a few minutes. The creams are ideal to spread on bruschetta or crostini, very good to be enjoyed as an accompaniment to appetizers, first and second courses. Once you open the jar, cover with oil and refrigerate for about 20 days.